President Trump attends a meeting on the global drug problem at the United Nations with U.N. Ambassador Nikki Haley a day ahead of Tuesday's official opening of the United Nations General Assembly. Trump told reporters at the U.N. on Monday that he hoped to have another meeting with North Korea's Kim soon. In a separate briefing on Monday, Pompeo said that he expects to travel to Pyongyang before the end of the year to help make arrangements for that meeting. Pompeo said sanctions against North Korea will continue. "The president remains resolute, now is not the time to ease pressure," he said. While Trump may hold off on any harsh words against North Korea, he will use his time at the General Assembly to push back against another potential nuclear threat: Iran. "You can bet the president will have well deserved strong words for the Iranian regime, which is among the worse violators of U.N. Security Council resolutions, if not the absolute worst in the world," Pompeo said. He said Trump will call on all countries to join the U.S. in its efforts to isolate Iran. When Trump spoke at the U.N. last year, the United States was still in the Iran nuclear deal negotiated by the Obama administration. Trump called the deal an "embarrassment." Trump pulled out of the agreement in May over the objections of European allies. Since then he has ratcheted up the rhetoric and reimposed sanctions against Iran. In July, Trump tweeted a warning at Iranian President Hassan Rouhani. He said Iran would "suffer" like few other countries before if it continued to threaten the U.S. The Trump administration has made clear that it will pressure Iran to prevent further development of its nuclear program, to stop its ballistic missile production and to end its support for malign activity in the Middle East. "That is going to be a very strong message and perhaps the predominant message that nations will take away from the General Assembly speech," Schaefer said. Rouhani is also scheduled to deliver a speech at the U.N. later on Tuesday, where he will have the opportunity to rebut Trump's remarks. All of this could set the stage for a tense meeting of the U.N. Security Council meeting on Wednesday. Trump will chair the meeting, which was initially supposed to be focused on Iran. The administration broadened the focus to denuclearization in general, but in a tweet about the meeting Friday, Trump only mentioned Iran. It is unclear whether Rouhani will choose to attend the session, but it is possible. The focus on Iran also puts the United States at odds with Security Council members France and the United Kingdom. Both countries lobbied unsuccessfully to keep the U.S. in the nuclear deal. "If Trump makes Iran the centerpiece of his remarks, the Europeans will have to respond," said Ilan Goldenberg, a senior fellow at the Center for a New American Security. "They will be as polite as possible and avoid trying to agitate him ... but they will say they disagree" with Trump about the Iran deal. It would not be the first time that Trump has clashed with U.S. allies this year. Trump was isolated and combative at the G-7 meeting in Canada in June and at the NATO meeting in Brussels in July. 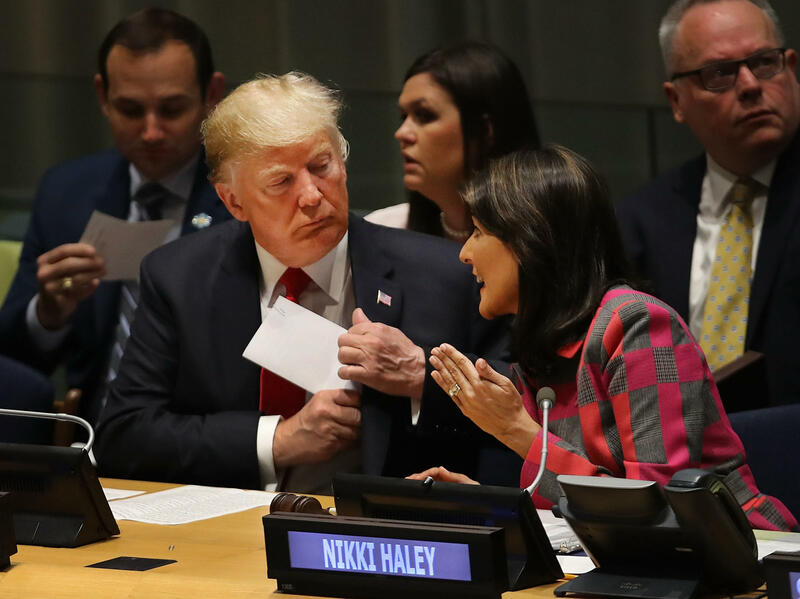 Trump has not been as harsh in his rhetoric about the U.N., but he has raised some concerns about the international body. "I've always said the United Nations has tremendous potential, but it has not lived up to that potential," Trump said in a video previewing his trip. The broad range of countries that attend the General Assembly may give Trump the chance to direct his ire mostly toward adversaries. "It's particularly bad when the U.S. looks isolated among its allies," Goldenberg said. "Trump having a feud with the Iranians is better than Trump having a feud with the French. He has enough bad guys to go after, maybe he won't go after our friends." President Trump today addressed a gathering of world leaders in New York at the United Nations General Assembly. PRESIDENT DONALD TRUMP: I honor the right of every nation in this room to pursue its own customs, beliefs and traditions. The United States will not tell you how to live or work or worship. We only ask that you honor our sovereignty in return. INSKEEP: The presidential talk on sovereignty also touched on foreign aid. He complained that the United States gives aid to other nations but does not receive it. The president also said his administration had accomplished, quote, "almost more than any other administration in the history of our country," a line that caused the assembled diplomats to laugh at him. NPR's Ayesha Rascoe has been covering the story. She's in New York. Hi there, Ayesha. INSKEEP: What was it like to watch that moment, everyone laughing at the president of the United States? RASCOE: It was a very striking moment because, as you know, President Trump has over and over again said that before he was president, the world was laughing at us, but no more. And so this was a moment on the international stage where you had other countries laughing at the president of the United States, laughing at Trump. But he took it in stride. He said he didn't expect that reaction, and he kind of went on. I don't know, though, that he will be happy if this - which it likely will be played over and over on the cable news shows. I don't know if he'll like that moment being highlighted. INSKEEP: And there was also some substance discussed here, or some substantive issues addressed, one of them being Iran. The president went to New York with the intent, it was said, of delivering a strong message to Iran after the cancellation of a nuclear deal some months ago. Here's part of the president's remarks. TRUMP: We cannot allow a regime that chants, death to America and that threatens Israel with annihilation to possess the means to deliver a nuclear warhead to any city on earth. Just can't do it. INSKEEP: But he canceled a deal that proposed, at least, that promised, at least, to keep a nuclear weapon out of Iran's hands for a good number of years. Is there any clearer sense of what he wants to replace that with? RASCOE: No. There's no broad plan. He's said that sanctions are being put back into place and that there will be more sanctions. And so essentially he called on the rest of the nations to isolate Iran. And so right now that is the plan. There doesn't seem to be a larger framework for what happens next, other than just putting pressure on Iran and hoping that they'll come back to a negotiating table with the U.S. under President Trump. INSKEEP: Haven't Europeans, Russia and China - so these would be the other nations that were involved in that nuclear deal - haven't they taken steps to strengthen it even as the president has been trying to pull them away from it? RASCOE: They have tried to. Now, it is difficult because you have had some companies, European companies, who were dealing with Iran who have pulled out because of the fear of sanctions. And so but they are trying to do things to kind of override the U.S. sentiment on the deal and to keep it in place. But it's difficult. INSKEEP: Very briefly, does the president indicate more progress could be coming, or some progress could be coming on North Korea and its nuclear program? RASCOE: He had very positive words for them, but he said that they're going to have to keep the pressure on with sanctions until there's progress on dismantling the nuclear program. INSKEEP: That's NPR's Ayesha Rascoe in New York. Thanks very much.